The Airstream® Class I Biological Safety Cabinet offers user and environment protection when doing experiments with organisms that are assigned under Biosafety Levels 1, 2 and 3. This Class I biological safety cabinet is equipped with protective features such as the ISOCIDETM powder coat that inhibits microbial growth, and optional UV lamp for decontamination. It is also equipped with a UV Door which provides safety against UV light. The door is integrated with VHP injection port for connection to VHP/ HPV generator for easy decontamination. The cabinet is powered by an energy-efficient DC ECM Motor offering 70% energy savings. 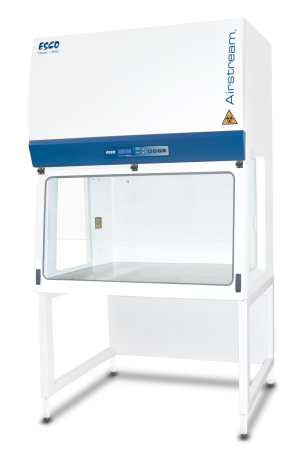 Bearing the EN 12469 certification by the Public Health England (PHE), Airstream® Class I Biological Safety Cabinet is an essential component in your laboratory.